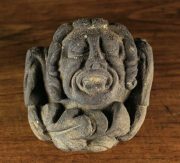 A 19th Century Classical Lead Face Mask, 9 in x 8 in (23 cms x 20 cm). 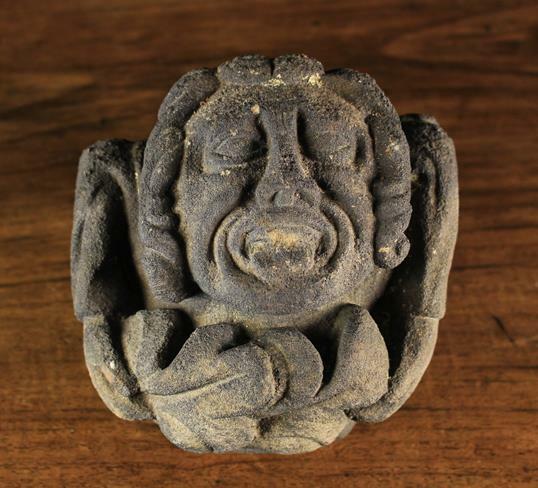 A 16th Century Architectural Stone Boss carved in the form of a man poking out his tongue and holding two large leaves, 6 in (15 cm) high, 6 in (15 cm) wide, 3½ in (9 cm) deep. 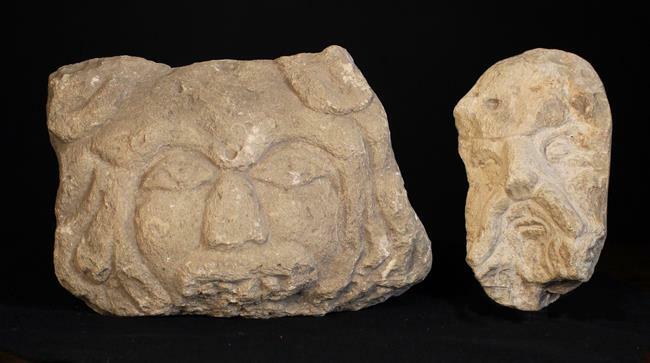 Two Naively Carved Stone Heads. 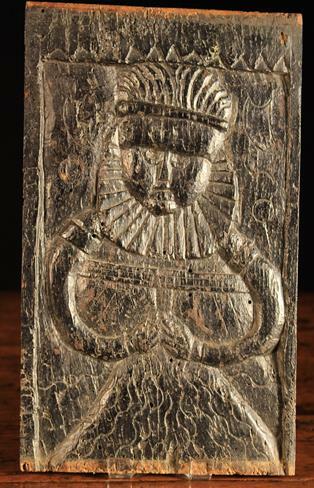 A 16th Century Riven Oak Panel carved with woman wearing a high ruff collar, holding her hands in prayer, 12½ in x 7½ in (32 cm x 19 cm). 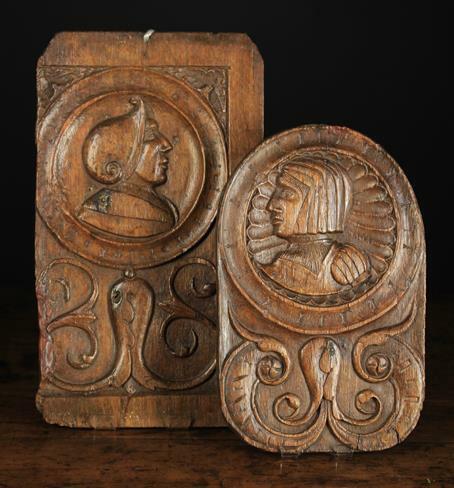 Two 16th Century Carved Oak Romayne Panels (A/F): One having rounded corners bordering the female portrait roundel and scrolled strap-work base, 13 in x 8¼ in (33 cm x 21 cm). 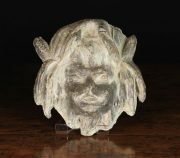 The other with profile portrait of a man with helmet, above scrolls of foliage, 16½ in x 9½ in (42 cms x 24 cm). 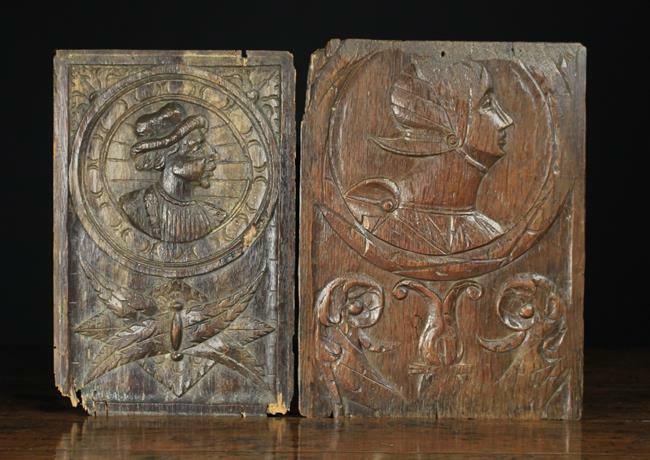 Two 16th Century Carved Oak Romayne Panels (A/F): One depicting a profiled lady's head wearing a bonnet within a roundel above foliate scrolls 14¾ in x 11 in (27.5 cm x 28 cm), the other with the bust of a merchant, 14½ in x 9½ in (37 cm x 24 cm). A 19th Century Oak Armorial Panel carved in the renaissance style with entwined scrolls of leaves surrounding a central voluted cartouche, 12¾ in x 20½ in (32.5 cm x 52 cm). 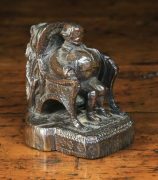 A Small 19th Century Treen Carving of a portly gentleman sat on chair with a clump of reeds and foliage to the rear, 3½ in (9 cm) high, 2½ in (6 cm) wide, 3½ in (9 cm) deep. 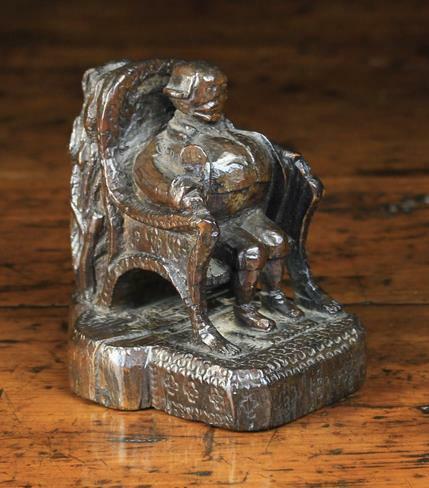 A Naively Carved Antique Wooden Split Spindle in the form of a Crusader wearing a long buttoned tunic with a cross on his chest, 12½ in (32 cm) in length. 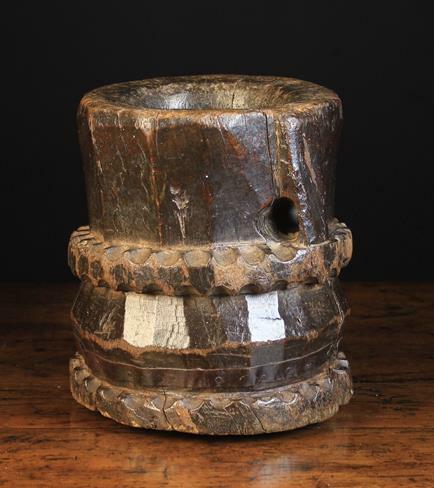 A 17th Century, or possibly earlier, 'Dug Out' Mortar. 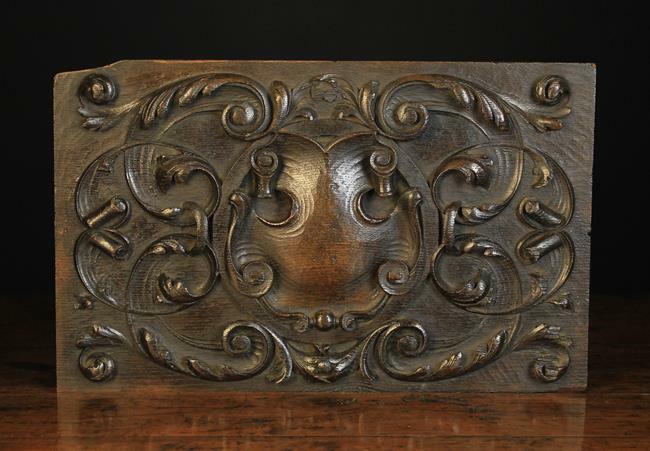 The facet cut sides decorated with chip carved flanges and having an integral handle and later iron bracing. 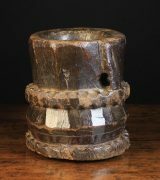 9½ in (24 cm) high.